Could there be a link between toxoplasmosis and dementia.....? Just a thought.....! Hi The prebiotic used was called Bimuno. Sprouted Bread. Is it Pre biotic? Can following the Mediterranean diet reduce people's incidences of depression? 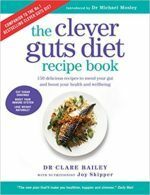 Clever Guts recipie book – are the cals per serve or for the whole dish? Post your bacteria friendly recipes please! Clever Guts Book destroyed Need a copy of Phase One meal planner please !